A lawyer with a Lagos-based legal firm, Tope Alabi and Co, located on 77B, Mobolaji Bank Anthony Way, Ikeja, Lagos, western Nigeria, has dragged the Federal Road Safety Commission, FRSC, to court over the new driver's licence and number plate introduced by the Federal Government. Joined in the suit filed at the Federal High Court in Lagos on 9 September are the National Assembly and the Attorney General of the Federation and Minister of Justice, Justice Alooma Mukhtar. 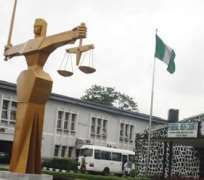 According to the motion on notice and motion ex-parte made available to P.M.NEWS by the lawyer, Tope Alabi, the court is to determine whether the National Assembly, as the first defendant, has power to legislate on the production and issuance of driver's licence and number plate under section 4 of the 1999Constitution of the Federal Republic of Nigeria as amended. Also, the court is to determine whether the provisions of the FRSC Act that empower it to produce and issue number plate and driver's licence are not inconsistent with the provision of section 4 of the Constitution; and whether the defendants along with their agents, servants or privies are right in directing the registered vehicle owners including the plaintiff to re-register when the existing registration is valid and subsisting. The plaintiff also wants the court to determine whether the defendants along with their agents, servants or privies are right in directing the holders of valid driver's licences and number plates, including the plaintiff, to renew same when the existing driver's licences have not expired. Among the reliefs claimed by the plaintiff are: A declaration that the defendant, the FRSC, lacks the powers to legislate on the issuance of number plate and driver's licence under section 4 of the constitution of the Federal Republic of Nigeria 2011; a declaration that by virue of the provisions of section 4 and 5 of the 2011 constitution of Nigeria, the production and issuance of number plate and driver's licence is a residual matter within the exclusive legislative and executive competence of the states. The plaintiff are also seeking a declaration that the defendants whether by themselves, agents or privies whatsoever or howsover described lack the powers in cracking down on those still using the existing registered number plates on their registered vehicles; and an order of perpectual injuction restraining the defendants whether by themselves, agents or privies whatsoever or howsover described from cracking down on those still using valid driver's licences pending the time within which same will expire and due for renewal. While speaking with our reporter, Alabi said FRSC's claim that one of the reasons for the introduction of a new number plate and driver's licence is because the old number plate and driver's licence are easily forged is baseless. The plaintiff opined that some fraudsters were caught recently with a large number of the fake new number plates and driver's licence.